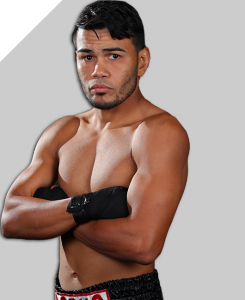 “Our last two opponents were southpaws,” says 26-2 featherweight Jesus Rojas, who will be facing 15-2 orthodox contender Can Xu on January 26th at the Toyota Center in Houston, Texas. “We’re working on our jab,” he says of training camp, “we’re working on our head movement, and we’re working on our lateral movement.” Indeed, different fighters require different camps. “What changed primarily,” says Rojas, “was the sparring. We’re (now) sparring with people who are right handers.” The fight, which will be for the WBA featherweight title, is one Rojas wants to win in impressive fashion. “I want to make sure that I win impressively,” the Caguas, the Puerto Rico native claims. An impressive win, after all, can lead to fights with such names as “Oscar Valdez, Leo Santa Cruz, or even (Josh) Warrington.” Not that he’s writing off Xu. “You have to be careful with what you’re doing with him,” he says of his upcoming opponent. “He’s a tall, strong boxer, and he’s ranked.” A native of China, Xu, 24, will be fighting on US soil for the second time in a row, his first American endeavor being a split decision win over Enrique Bernache last September in Las Vegas. Fair enough. It’s Diaz, after all, who has to impress his home crowd. Not that Rojas doesn’t have anyone to impress himself. “I’m also a family man,” he says, adding “that’s been one of the keys” of his successful training camp. A native of Puerto Rico, Rojas is also aware of the island’s rich heritage in the fight game. “It’s an honor and it’s a joy,” he says of representing his home (especially the fact that he’s “the 59th champ” in Puerto Rico’s history) “and I feel really proud of it.” Yet, at the moment, Rojas knows must focus intently on his battle with Rios. “We’ve definitely been making some changes,” he says of his training. Diaz, who lost his last fight, a title shot against the supremely gifted Gary Russel Jr., will be looking for redemption, a fact Rojas is well aware of. Still, Rojas feels it will be a different kind of fight than Diaz’ failed title attempt last May. Russel, Rojas points out, is a slick boxer, “whereas Jesus Rojas is a guy who comes to fight.” As training winds down, Rojas is ready for fireworks. “I think it’s going to be a war,” he says. Although Diaz is the man before him, Rojas has plans for the future. “I’m focused on this fight,” he claims, “but I also want to be remembered and known as one of the best world champions and doing that means to fight the best.” One of the best that Rojas would like to face is the WBA super world featherweight champion Leo Santa Cruz. Like many others, however, Rojas makes it clear that the WBA, which is widely regarded as a random and generally unprofessional organization, isn’t always in the business of ordering matches that would make sense. “I feel sad,” he adds. “I started boxing for eleven years and I’ve been working very hard and training hard…because of that I’m actually very sad that things like that (a match with Santa Cruz) can’t take place.” Great though it is, boxing is a brutal sport – in more ways than one. The Fantasy Springs Casino in Indio, California hosted Friday night’s Golden Boy ESPN card featuring veteran welterweights Jesus Soto Karass and Mauricio Herrera. First, though, light heavyweight Vyacheslav Shabranskyy, 18-1, faced Todd Unthank May, 10-0-1, in a ten rounder. 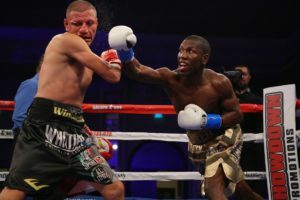 Shabranskyy, who lost an important fight to Sullivan Barrera last December, employed a powerful, methodical game plan, one which was clearly taking its toll on the undefeated Unthank May in the fifth. By the end of the seventh, it was obvious Unthank May’s corner should stop the fight. He was simply taking too much damage. And indeed, the fight didn’t reach the eight round. Next up was a six round super middleweight throwdown between Jaime Solorio, 10-1-2, and Niko Valdes, 5-0. Solorio was able to land a few good shots early on, but Valdes was clearly able to control the tempo with steady aggression and sound footwork. By the middle of the fight it was obvious that Valdes was stronger and more skilled, but that his patience made his style lack excitement. Not to be outdone, however, Solorio ended the fourth whaling away at Valdes, paying particular attention to his opponent’s body. Still, Valdes was able to reassert control as the fight progressed further and walked away with an easy UD win. It was time for the main event. Both Soto Karass, 28-11-4, and Herrera, 23-7, had their notable moments throughout their careers. Soto Karass had fought a who’s who of opposition throughout the years while Herrera was still best known for his controversial loss to Danny Garcia in Puerto Rico back in 2014. Friday night was, in a sense, a last ditch effort for each fighter to attain late career glory. Both men remained somewhat patient early on, though Herrera was going effectively to the body. He was also finding a regular home for his jab by the middle of the second. Soto Karass, however, ended the round moving forward and using his reach to good effect. Indeed it was Soto Karass who began to look stronger in the third and then actually started taking control of the fight early in the fourth. Herrera, though, was there to win and the two men nailed each other repeatedly in the middle of that chapter. Still, it was Soto Karass who was walking his man down and looking to dominate as the fight entered the middle rounds. Yet, Herrera’s jab returned to him in the fifth and he was able to land hard and clean. Soto Karass, however, finished the round strong. It was a solid affair. As the fight worked its way through the middle rounds, it became clear that these were indeed two aging fighters plying their trade. The action was in bursts and the tempo was rather slow at times. Slow but steady. In this, the bout seemed to actually resemble an MMA match, where the action is often punctuated by notable pauses. 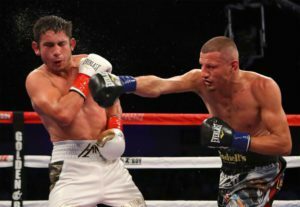 By round eight however, the action became somewhat explosive, with Soto Karass ripping into Herrera’s body and Herrera landing in kind. It was a see-saw affair, to be sure. Herrera was more accurate, but Sotto Karass seemed to perhaps have a bit more power. By the end of the ninth, things had gotten bloody. Herrera’s face was an absolute mess as Soto Karass finished the round battering the man’s head around the the ring. It was now worth wondering how much more Herrera could take – and how much more Soto Karass could give. The tenth and final round was a doozy, with both men firing away and showing tremendous heart. That was no surprise, but it was impressive to watch nonetheless. These were two admirable adversaries. In the end, I gave it to Soto Karass due to the power of his punches. The judges apparently saw it differently, giving the nod to Herrera. Huge credit goes to both men. What a fight. On Saturday night HBO will broadcast two world championship fights from two different venues. Pound for pound king Roman “Chocolatito” Gonzalez will be bumping up to the junior bantamweight division to chase after another world title when he faces off against Carlos Cuadras. If he is successful he will have won titles in four different weight classes. 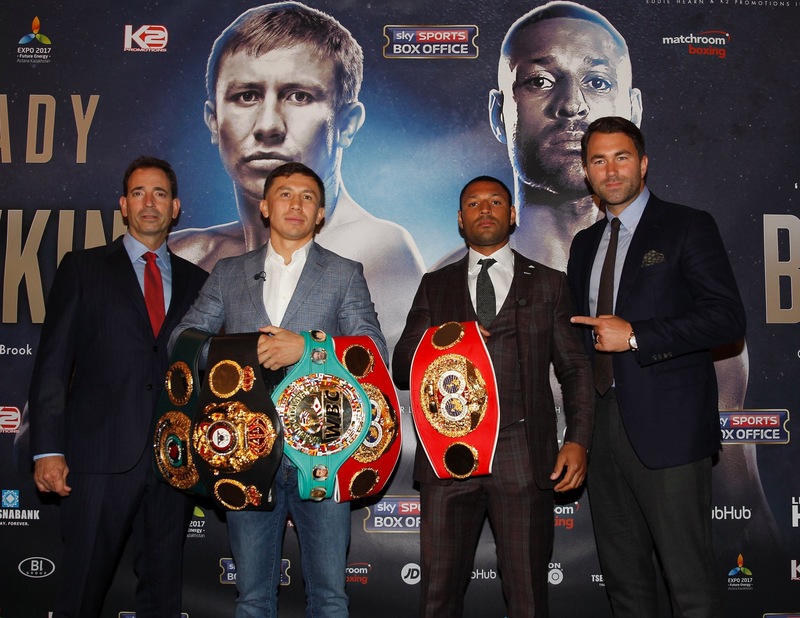 Earlier in the day knockout artist Gennady Golovkin will be defending his middleweight titles when he faces welterweight world champion Kell Brook. The Gonzalez vs. Cuadras bout will take place at the Forum in Inglewood, California and the Golovkin vs. Brook bout will take place at the O2 Arena in London, England on Brook’s home turf. HBO will also be televising a rematch between Yoshihiro Kamegai and Jesus Soto-Karass in the junior middleweight division. Their previous fight was considered by many to be a fight of the year candidate. Roman “Chocolatito” Gonzalez is a three division world champion and considered by many to be the best pound for pound boxer in the world today. 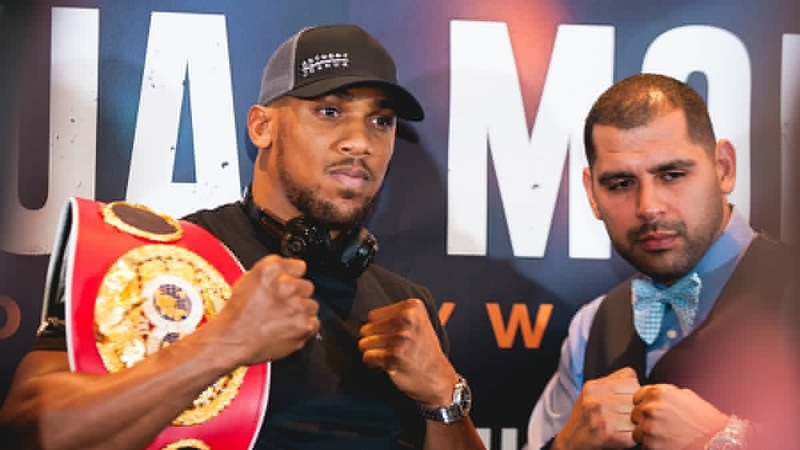 However, there are limits to how many weight classes an individual can be a champion in and he’s facing a legitimate junior bantamweight world champion. Gonzalez will be giving up five inches in height and two inches in reach to Cuadras. Cuadras is also one year younger than Gonzalez, but both are in their physical primes. They both have been fairly active in the past two years. Cuadras fought three times in 2014 and in 2015, and already fought once in 2016. Gonzalez fought four times in 2014, three times in 2015, and once so far in 2016. They both had experienced success as an amateur. Cuadras is a Pan American gold medalist and a gold medalist in the International Junior Olympics. Chocolatito has an alleged record of 88-0 as an amateur, but does not have any notable international amateur tournament victories. Chocolatito has beaten the likes of Yutaka Niida, Juan Francisco Estrada, Rocky Fuentes, Akiri Yaegashi, Edgar Sosa, Brian Viloria, and McWilliams Arroyo. Cuadras has defeated the likes of Marvin Mabait, Luis Concepcion, Dixon Flores, Koki Eto, and Richie Mepranum. 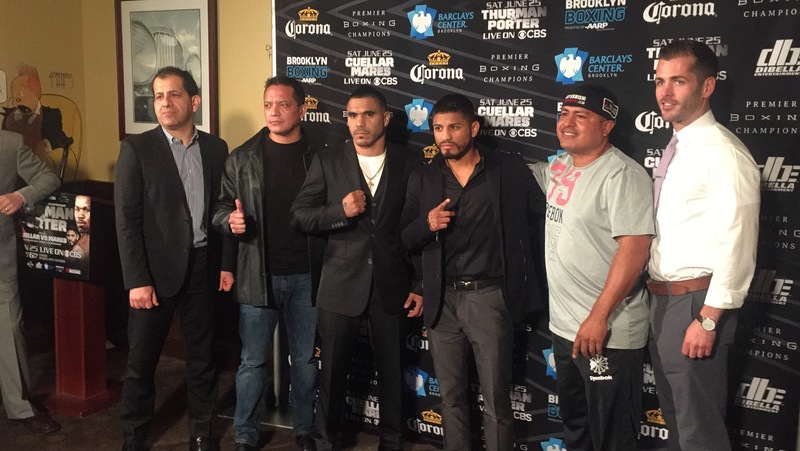 Gonzalez has more world title fight experience and has a record of 14-0 in world title fights. Cuadras has a record of 6-0 in world title fights. Both boxers have considerable power. Cuadras has twenty seven stoppage victories, and three of his past five fights were by stoppage victory. Gonzalez has thirty eight stoppage victories. It will be interesting to see how Gonzalez handles the length and reach of Cuadras. Gonzalez, who was a world champion in the minimumweight division, will likely be unable to jump additional weight classes if he’s victorious on Saturday and he has a very tough test ahead of him. 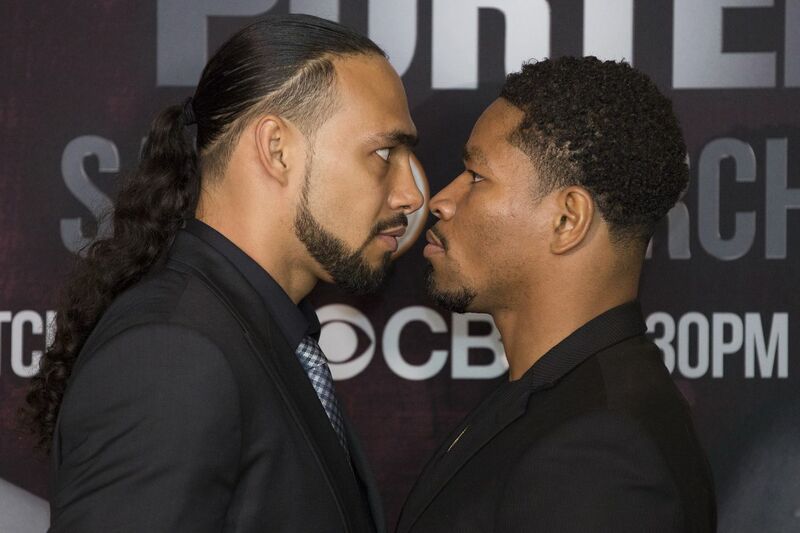 This should be an entertaining and technical bout, but Gonzalez should be able to pull off the decision victory, but may have his chin tested in the process. Don’t let the fact that Kell Brook is jumping up two weight classes to fight Gennady Golovkin fool you. Brook is a large welterweight and Golovkin is a smaller middleweight. In fact, Brook has been weighing in heavier than Golovkin in the weeks leading up to the fight. One of the biggest question marks about Golovkin is his age. He’s thirty four years old and doesn’t have many years left in his prime. His opponent is four years younger than him. Golovkin, however, will have a slight one and a half inch height advantage and a one inch reach advantage. Despite the fact he’s a major star in boxing, Golovkin has kept a fairly active schedule. He has fought once in 2016, three times in 2015, and three times in 2014. Brook has been having trouble finding a big fight in the welterweight division and fought twice in 2014 and in 2015, and once in 2016. Golovkin’s power is well known and can be considered legendary. He has thirty two knockouts on his resume and is in the midst of an incredible streak that consists of twenty two wins by knockout in a row. Brook’s power can’t be overlooked, he has stopped twenty five opponents and has one four of his past five fights by stoppage. Brook will be fighting in front of his home crowd at the O2 arena and that will be a big advantage for him. He has defeated the likes of Kevin Bizier, Frankie Gavin, Ionut Dan Ion, Shawn Porter, Vyacheslav Senchenko, Matthew Hatton, and Luis Galarza. The last person to go the distance against Golovkin was Amar Amari in 2008. He has steamrolled every boxer he’s faced since then. 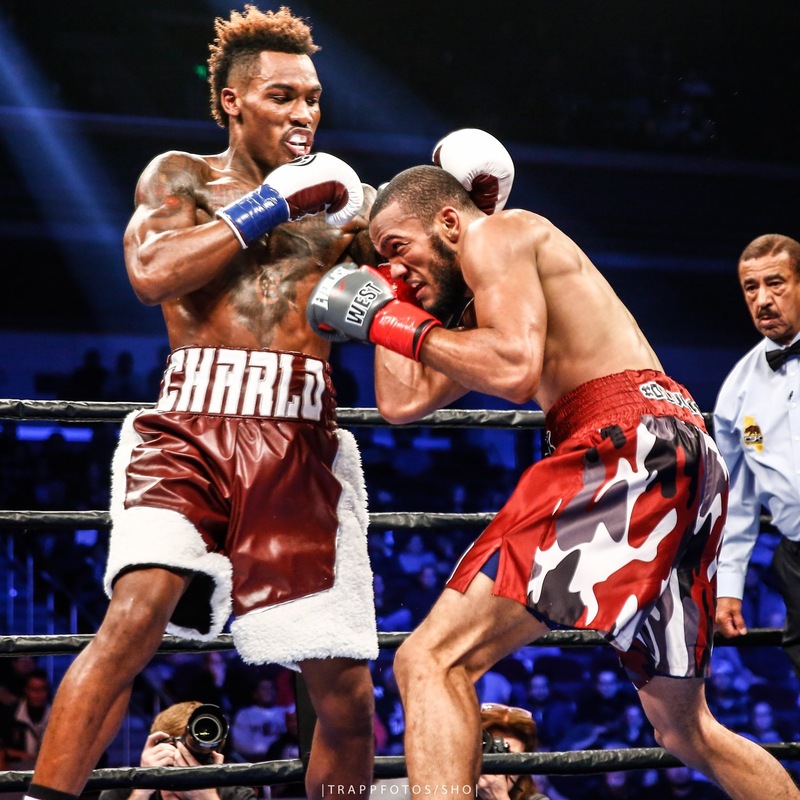 He has defead the likes of Dominic Wade, David Lemieux, Willie Monroe Jr., Martin Murray, Marco Antonio Rubio, Daniel Geale, Curtis Stevens, Matthew Macklin, Nobuhiro Ishida, Gabriel Rosado, Kassim Ouma, and Grzegorz Proksa. Golovkin has to be very careful to not overlook Kell Brook. Brook is a very good, technical boxer and is considered by many to be a top 10 pound for pound fighter. Golovkin’s power should be able to lead him to victory, but don’t be surprised if he knockout streak ends on Saturday night.